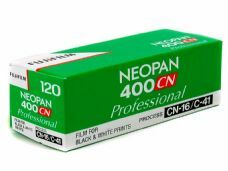 FUJI NEOPAN 400CN is a black and white film which processes in standard C41 colour negative chemistry. 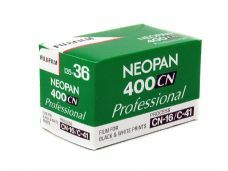 Similar to Ilford's XP2 or Kodak's BW400CN, this film is ideal where the photographer has no access to traditional black and white processing facilities - C41 is the standard process used in all high street mini labs (eg: Boots, Snappy Snaps, Tesco etc etc.). However this is not the only reason for using these type of black and whtie films: because the emulsion contains image forming dyes (like colour film) the results are very low grain and can lend a great, smooth, feel to the resulting prints. Further to this, the film is very flexible, like colour negative film, in exposure, with great latitude.